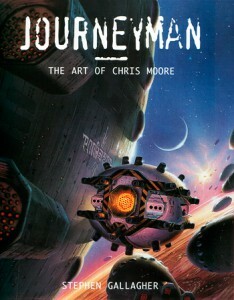 The first collection by Chris Moore, internationally renowned science fiction illustrator, includes a dazzling array of paintings completed for book covers, posters and albums. From life-like to fantastical, dramatically colourful to simple sketches, the versatility of Chris Moore’s work is a feast for the eye. Through a series of conversations, acclaimed thriller writer Stephen Gallagher tells the story of the modern-day journeyman and along the way reveals fascinating insights into the process of creating art.